BERKELEY — In late July, UC Berkeley fire ecologist Scott Stephens was working in Stanislaus National Forest, gathering data on how a century had altered its character. What he saw were the signs of a clear and present danger. On Aug. 17 the Rim Fire ignited, changing the forest far more, and in far less time, than anyone could have imagined. The blaze scorched hundreds of square miles — roughly a quarter-million acres — in the Stanislaus, and thousands of acres in neighboring Yosemite National Park. It left what has been described as a moonscape, in the process killing wildlife, destroying habitat and – as he discovered when he returned in September – reducing his 400-odd research plots to embers. “We know that taking fire out of ecosystems is a big deal in places like mixed-conifer forests, which used to burn every decade or so,” he says. Then, in 1905, the Forest Service was established – not coincidentally, the year the last fire occurred in the area Stephens was studying. It wasn’t long before the agency began implementing its so-called 10 o’clock policy, which called for extinguishing every fire by 10 a.m. the morning after it was discovered. Even as density has increased, though, the average diameter has dwindled as younger trees fill in the spaces between older, bigger ones. And the amount of dead and downed material on the forest floor has quadrupled or even quintupled, Stephens says, to perhaps 40 tons per acre. That adds up to an unprecedented “continuity of fuel,” he says, enough to feed a raging inferno fierce enough to destroy the imposing, old-growth Douglas fir and ponderosa pine trees beloved by visitors to Stanislaus and Yosemite. “A lot of places in the Sierra Nevada have been harvested so thoroughly, the big old trees are gone,” says Stephens, who grew up in a lumber-mill family. “But this place was different. It still had trees that were three-and-a-half, four feet in diameter. These are trees that are 300 years old, easy. “I was really a forest person in a big way when I was a young kid,” says Stephens, though not, perhaps, in quite the way he is now. Both of his parents worked at Humboldt County’s Pacific Lumber Co., as did his grandfather and three of his uncles, before the company fell victim to a notorious hostile takeover in 1986. “It was so close to me that I never saw it as all that special,” he says. He earned his undergraduate degree, in fact, in electrical engineering, worked as an engineer for the U.S. Department of Defense and lectured at Sacramento State, his alma mater, for a number of years. He loves fire science. He seems to derive special pleasure from his work in research stations like the UC Berkeley-run Blodgett Forest near Auburn, where he and his students conduct experiments with prescribed burns. They set these themselves with drip torches, steel cans with a highly combustible mix of diesel and gasoline set off by a burning wick. Among the most crucial lessons, he says, is the ecological importance of natural forest fires, and the counterproductive nature of suppression. Climate change and drought, he adds, only exacerbate the dangers. The good news, he says, is that more and more land managers appreciate the vital role natural fires and controlled burns can play in preventing future Rim Fires. The bad news: Population growth in and around national forestlands, combined with budget constraints on both federal and state agencies, greatly complicates the task of adapting management policies to forests’ need for smaller, more frequent, less destructive fires. The National Park Service has recognized this for decades – which helps to explain why the Rim Fire wreaked most of its destruction outside Yosemite’s borders – and even the Forest Service has recently seen the light, Stephens says. But the agency has been hampered by the need to protect homes and structures, which means putting fires out instead of letting them burn. “People living in the urban interface have really changed the whole fire dynamic,” Stephens explains, “because now, when a fire starts, if it’s near anyplace that’s got people, all of the engines go to structure support. They try to defend houses, they cut shrubs around them, they burn out away from them and they basically put fires out that are coming in. “Structure protection costs a fortune,” he adds. As long as the U.S. government keeps subsidizing fire management in the urban interface – where it has no authority to restrict private building — federal agencies won’t have the resources to ensure more sustainable forest ecosystems, Stephens says. He and his Science co-authors suggest making the states responsible for the costs of firefighting in the urban interface. The recommendation, which would require an act of Congress, is “heartburn city for California,” he admits, and won’t be popular with other budget-strapped states, either. 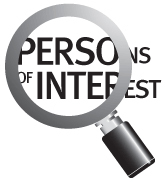 To meet other “Persons of Interest,” click above.